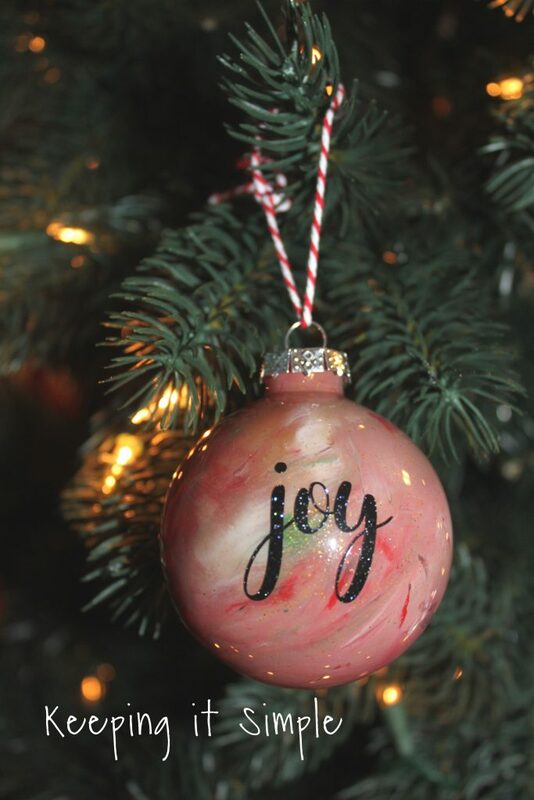 Making homemade Christmas ornaments is one of my favorite things to do! It’s so fun to personalize your Christmas tree. 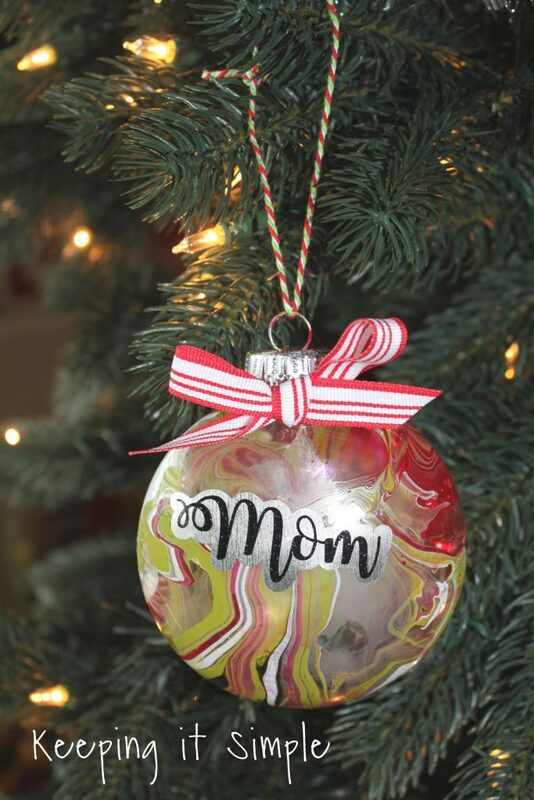 I love having my kids make them with me so that we can have lots of fun and festive ornaments on it that they made :). 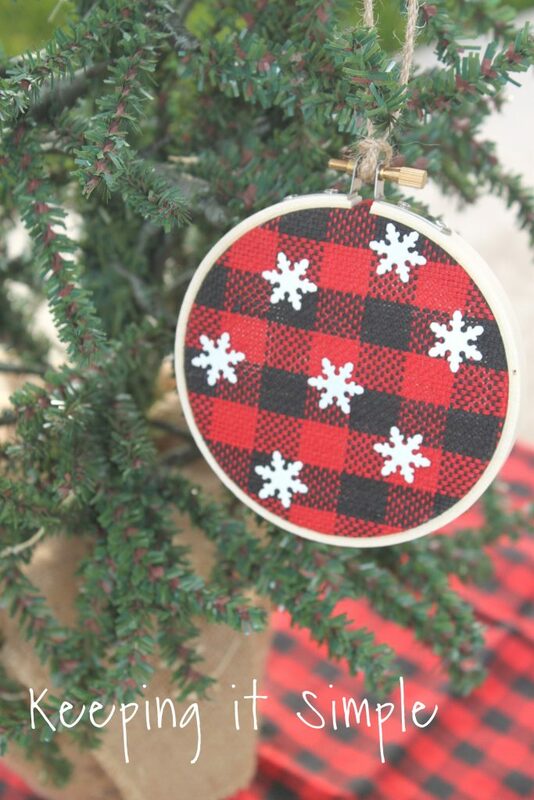 Since buffalo plaid is so popular right now, I thought that buffalo plaid embroidery hoop ornaments would be perfect thing to make for our Christmas tree. I love how these turned out! 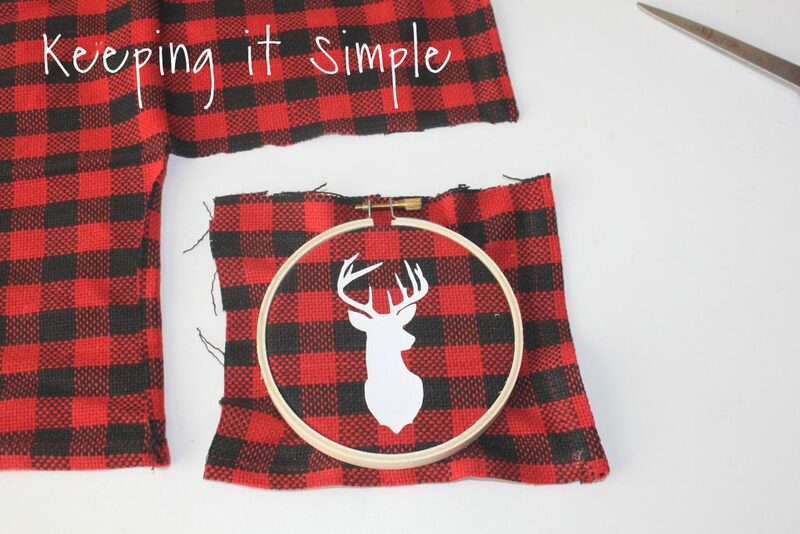 You can do them more rustic and add a deer or moose to it. Or you can have it be more festive and fun and add some glitter to them! 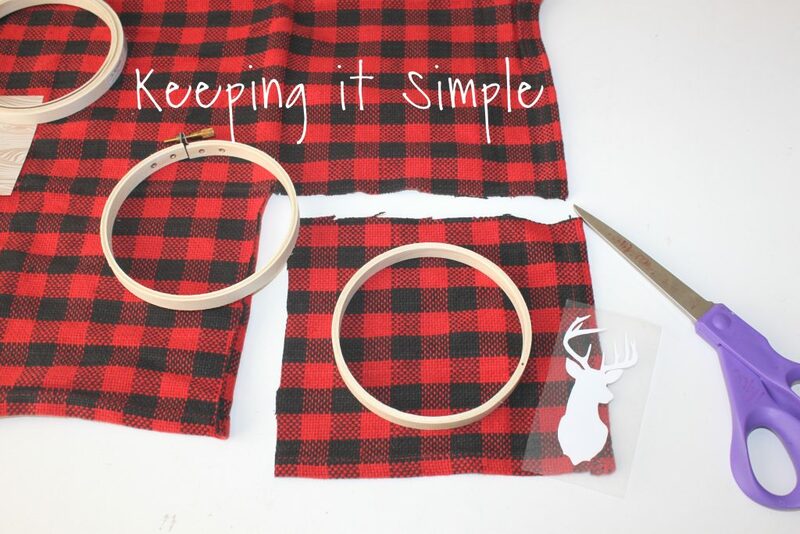 Also you could paint/stain the embroidery hoops to really make them personalized. 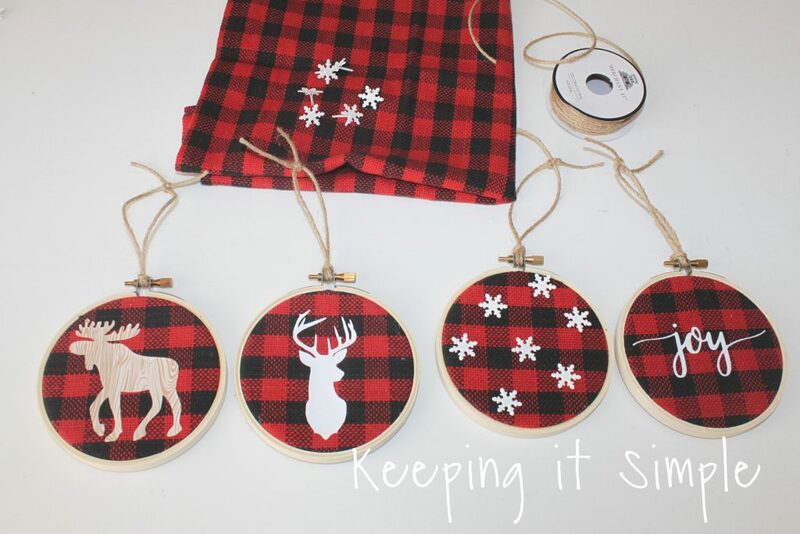 Here is a quick video to show you the process of how to make these embroidery hoop ornaments. 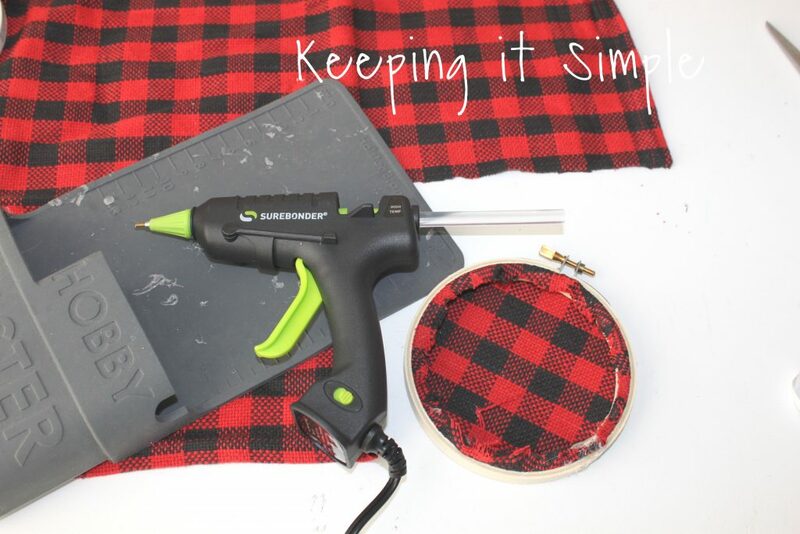 I started with some buffalo plaid fabric. 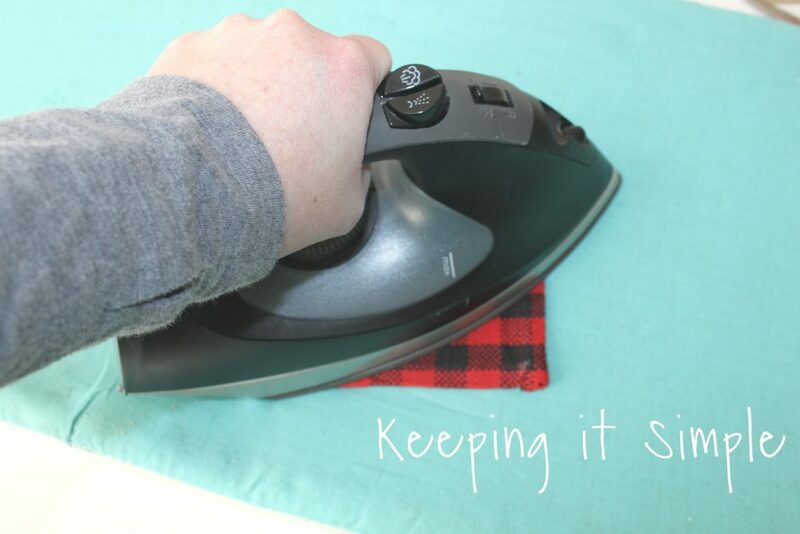 I wanted a fabric that had smaller squares in it and I found that the fabrics in the fabric sections had bigger squares, so I ended up using a napkin. It was the perfect size! I got this one from Hobby Lobby. I then used the small embroidery hoops and heat transfer vinyl. 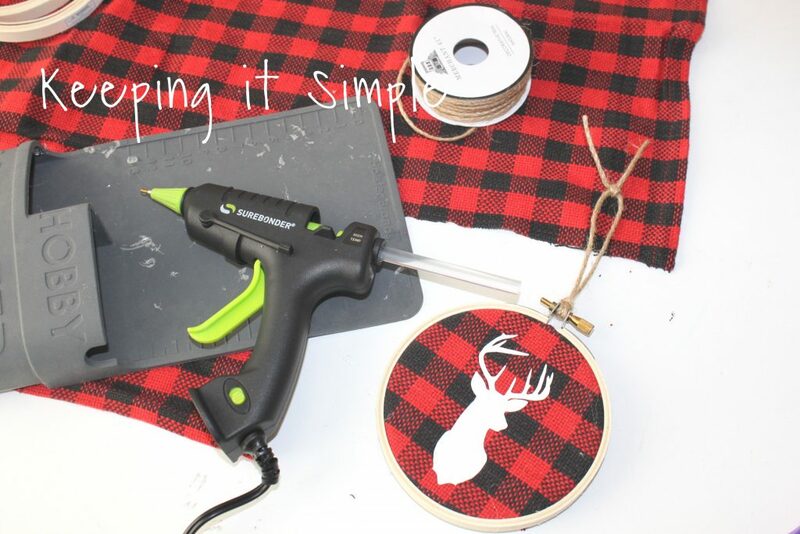 For the deer ornament I used an Easyweed HTV in white. I then weeded the vinyl and then cut enough fabric that would wrap around the embroidery hoop. 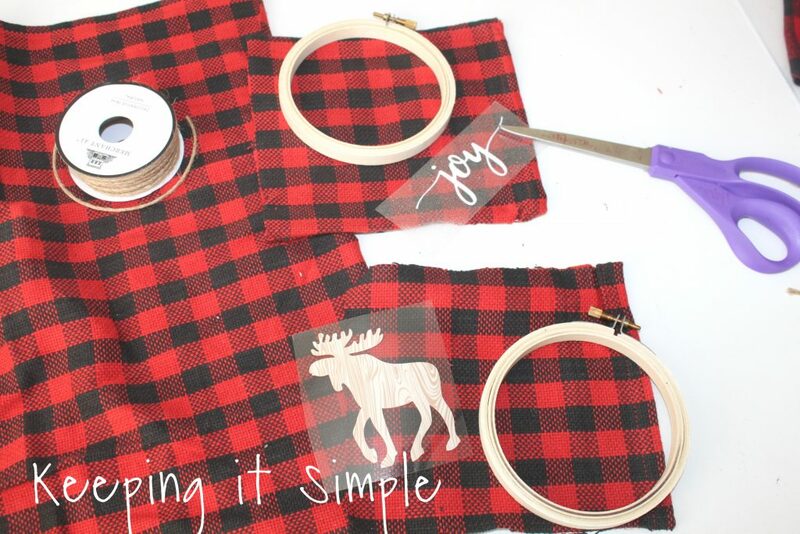 I then ironed on the deer onto the fabric. I ironed it for 15 seconds, holding down the iron with enough pressure that the HTV really adheres to the fabric. I then took off the plastic, flipped it over and ironed the other side. I then put the inside hoop under the fabric, making sure that it was nice and centered. Then I put the outside hoop onto the front and tightened the hoop. 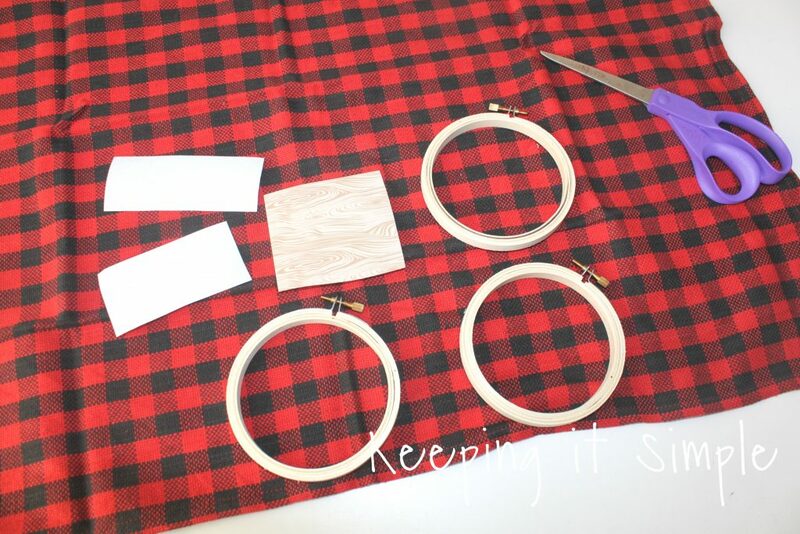 I then flipped it around, cut off the fabric around the hoop and then glued it onto the wood. 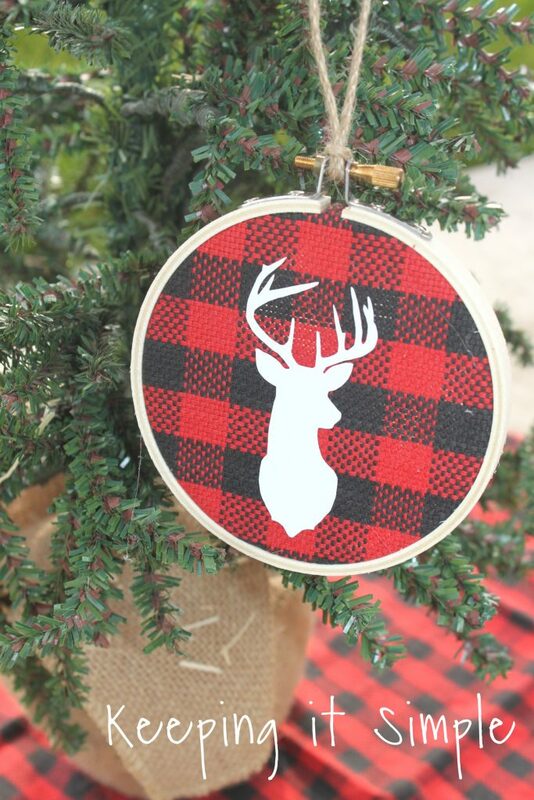 I then added some twine onto the hoop. 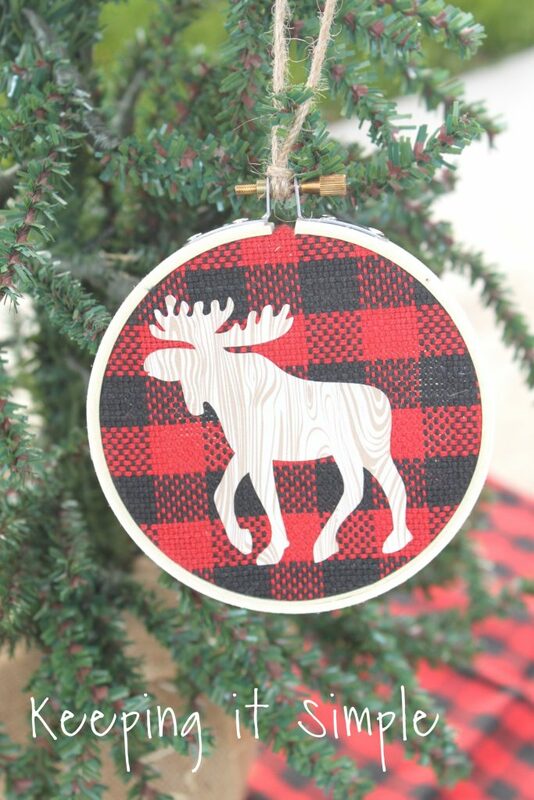 For the joy and moose ornaments, I made them the exact same way. For the moose I used a wood texture HTV this one is called wood texture #2. For the joy I used a white glitter HTV. 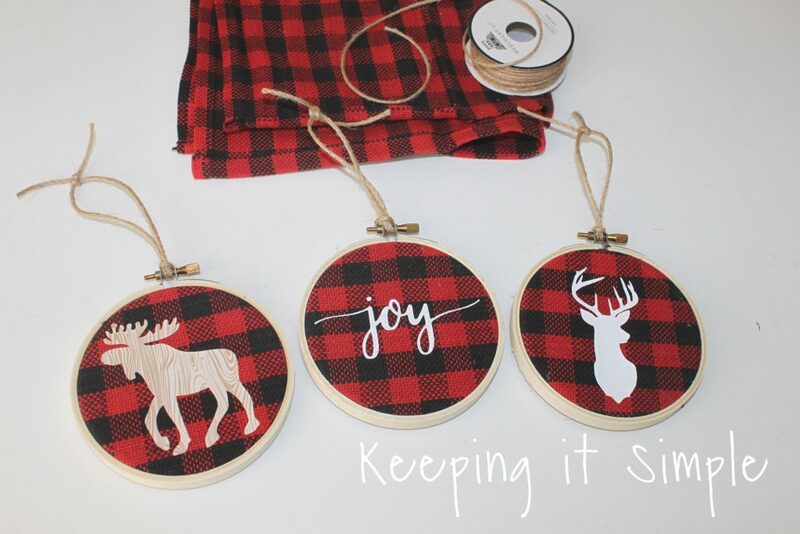 Here are the three embroidery hoop ornaments that I made using heat transfer vinyl. 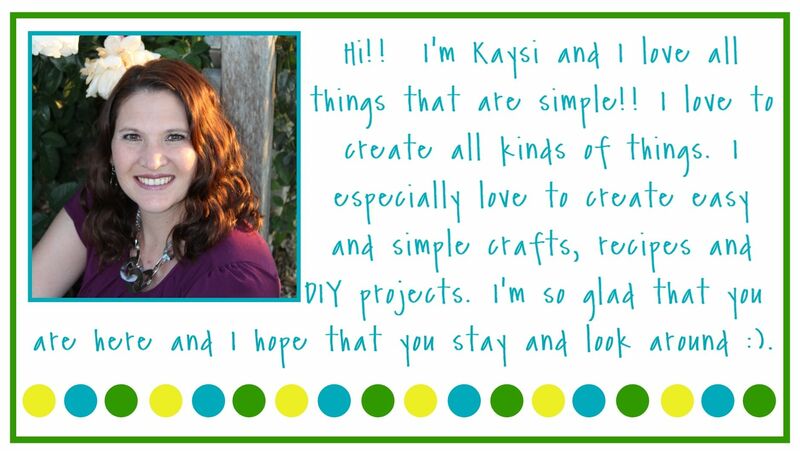 I wanted to show you that you don’t have to have an electronic cutter to make these! You could use foam stickers or something else. I used some glitter snowflake brads and they were perfect for these! 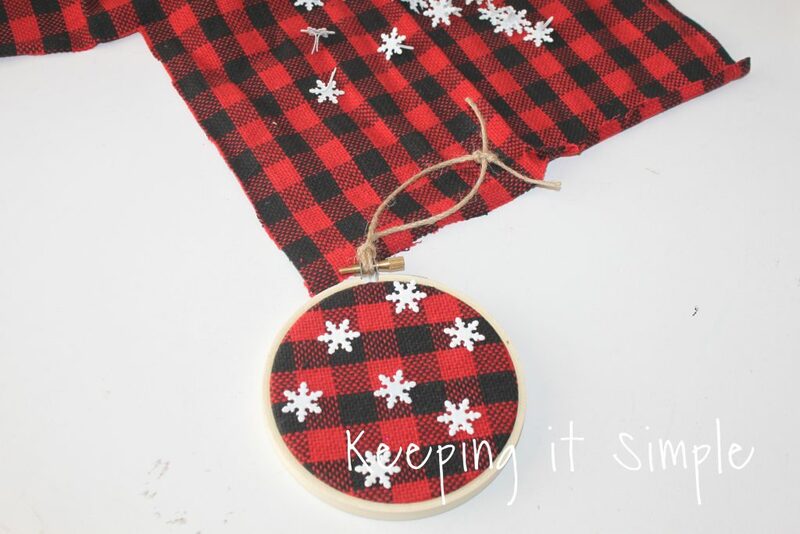 When making this one, I put the fabric onto the hoop first before putting on the snowflakes. 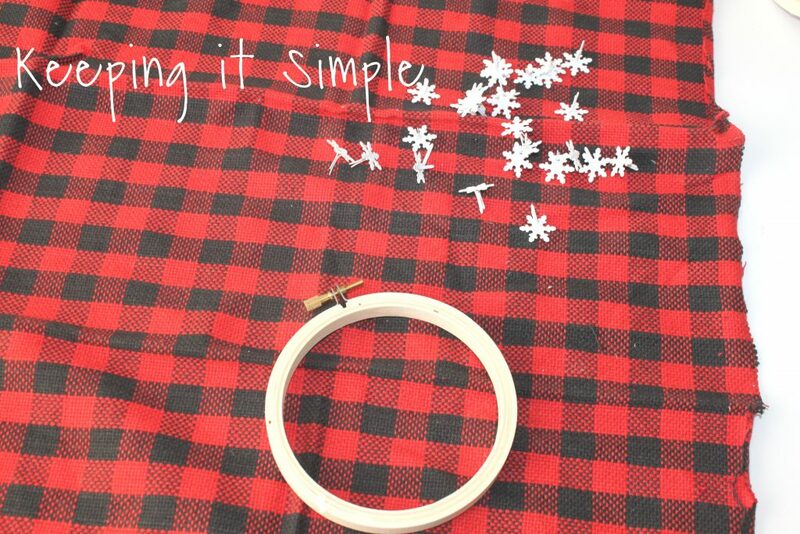 Once the fabric was on, I then put the snowflakes onto the fabric. You don’t need scissors or anything, I was able to just poke the brads through the fabric. One benefit of using brads was when I wanted to move the snowflake and place it somewhere else, I could :). And that’s it! They were so easy to make and only took about 5 minutes to make. 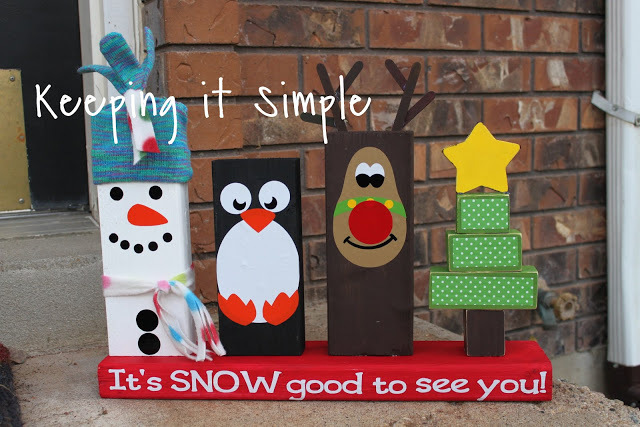 I love how they turned out and I can’t wait to make some more with my kids this holiday season. They look amazing on the tree! I love the look of the snowflakes, they are so fun! The wood texture HTV is so awesome, it matches the embroidery hoop so well! I made these for neighbor gifts this year, so I ended up making about 65 of them! 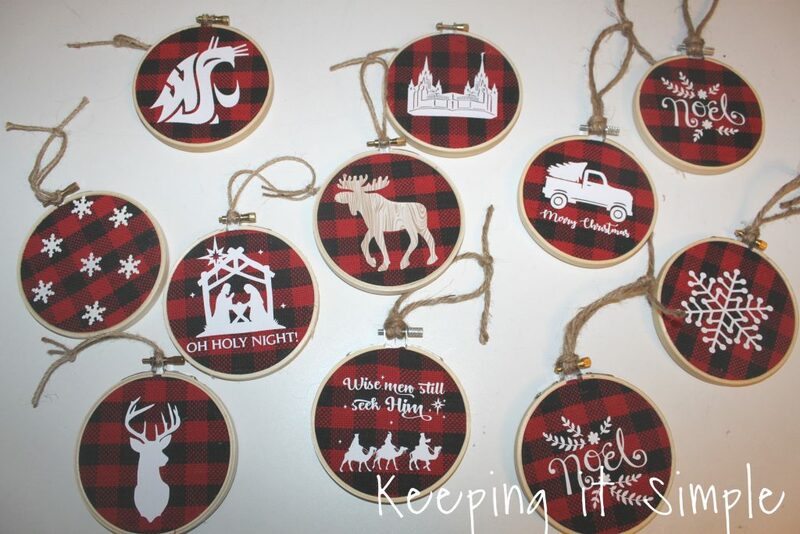 Here are a few more designs that I used for the ornaments. 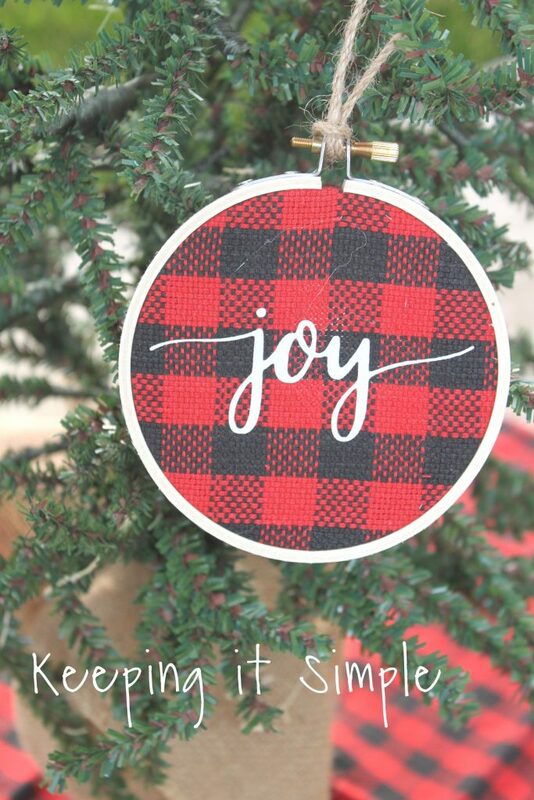 Make sure to check out my other Christmas craft ideas!